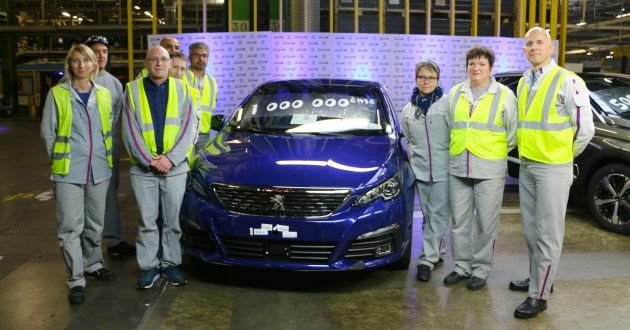 On November 27, 2018, approximately 10,000 employees at the PSA Sochaux plant celebrated the release of the 500,000th Peugeot 3008 SUV, and more importantly the one millionth Peugeot 308. Both models are manufactured at the same plant and are dubbed the ‘cradle of the Lion brand’, or as the French calls it, Origine France Garantie. Since its launch in October 2016, the 3008 has been a highly successful model for Peugeot. It’s currently the third best-selling vehicle in France for 2018 – together with the 2008 and 5008, Peugeot leads the SUV category in Europe in terms of sales. The 3008 is also the leader in the C-segment SUV category, and runner-up in all categories of passenger car registrations in France. It has 63 awards to its name, including the 2017 Prestigious Car of the Year and 2017 European Car of the Year awards. Next, production of the Peugeot 308 has finally reached the millionth mark. The second-generation C-segment vehicle was introduced five years ago in 2013, and it is currently leading sales chart for its category in France. Not surprisingly, it places third (behind the 3008) in overall passenger car registrations in France. Both the 308 and 3008 were developed by project teams based at the Sochaux R&D site, and tested on the tracks of the Sochaux/Belchamp Experimentation Centre. The 308 is being produced at a rate of 860 units a day, and over 1,000 units daily for the 3008 – the latter is produced seven days a week. The Sochaux plant is expected to produce nearly 500,000 vehicles this year. Since it begun operations, the facility has produced over 23 million vehicles, primarily for the Peugeot brand. Lucky they broke off relations with Toyota, otherwise one of their foreign CEO wud probably lingkup in Nippon prison by now. Next year Iriz will reach 1million units too.. According to basher it’s because the car is unreliable, expensip spare parts, and need to wait it come from France, and supposedly RV sux. Though I’ve not owned a Peugeot, I’ve owned a Naza sold Kia before & I’ve no problems with the dealers. I don’t see how Naza’s support system would be different, and I don’t think Peugeot would have bought a stake in the production line at Gurun if Naza was a lousy partner. You want to talk about bad dealers take a look at Tan Chong. The only reason Renault is moving any cars is because they’re selling it at huge discounts, which doesn’t help with RV. This despite Renault being a good car – I bought one of those huge discounted Renaults & I’m perfectly happy with the car, way better offering than any Japanese econoboxes. Just look at the Captur, could have been a worthy B-RV/Rush competitor but priced exorbitantly high! And Nissan, despite being a Japanese car brand lags way behind the other two Japanese brands. Their product lineup is like so not updated. Compare the Almera to a City or even a bloody Vios and you’ll see how far they are behind. So honestly Naza isn’t that bad. Sure they might need to push harder to combat the pro-Jap sentiments that permeates in the Malaysian car market, but at least they’re trying by bringing in an updated product line. Any 308 owner here ? Mine (1st batch) already 110k & I love the car. No big issue so far.